I’ve never liked the little strings that come attached to bagged tea. I appreciate that they make it easy to handle the bag, but more often than not the string slides down into the hot tea as it steeps and needs to be fished out – defeating the purpose of having a string in the first place. The reason for the slide is that the string is hard to secure. 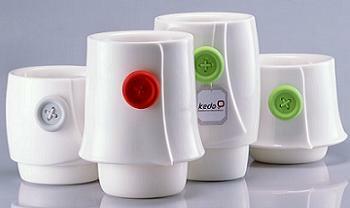 The design of these Tea Code Cups neatly solves that problem and makes string tea bags a lot more convenient to use. The cups have what looks like a button on their sides that you can wrap the tea bag string around to hold it in place. The sides of the cups, which come in various sizes, are double walled so they don’t get too hot to handle when you are drinking (or trying to remove the tea bag string). A spoon will work well for fishing out a tea bag, but this type of cup could be a nice addition to the collection of, say, a Lipton lover who wants to stick with the string-ed tea bag no matter what. There is a cute little animation showing how these cups work here, although if you end up ordering some, I think you’ll find them to be pretty self explanatory.